BACKGROUND AND PURPOSE: Perfusion CT (PCT) provides a rapid, reliable, and non-invasive technique for assessing tumor vascularity. The purpose of this study was to assess whether pretreatment dynamic perfusion CT (PCT) may predict response to induction chemotherapy and midterm progression-free survival (PFS) in advanced oropharynx squamous cell carcinoma (SCCA) and to compare the results with those derived by tumor volume measurements. MATERIALS AND METHODS: Nineteen patients underwent routine contrast-enhanced CT (CECT), pretreatment PCT, and conventional endoscopy. Tumor response was determined according to radiologic (RECIST) criteria. The PCT parameters, tumor volume, radiologic response, and PFS were analyzed with use of Cox-proportional hazards model, receiver operating characteristic (ROC), and Kaplan-Meier analysis. RESULTS: The baseline blood flow (BF), blood volume (BV), and permeability surface area product (PS) were significantly higher, whereas mean transit time (MTT) was significantly lower in the responders than in the nonresponders (P ≤ .002). BV showed 100% sensitivity, MTT and PS had the highest specificity (100%), and BF showed 84.2% sensitivity and 66.7% specificity for prediction of tumor response after induction chemotherapy. The pretreatment tumor volume correlated with PFS in the pooled patients group (r = 0.4; P < .0001), whereas postinduction tumor volume correlated significantly with PFS in the responders and nonresponders (r = 0.22–0.64; P ≤ .006). Pretreatment tumor volume (P = .0001) and BF (P = .001) were significant predictors for PFS. CONCLUSIONS: Pretreatment PCT parameters may predict response after induction chemotherapy. Tumor volume and BF values may predict PFS in patients with advanced oropharyngeal SCCA. The primary objective of our study was to evaluate prospectively collected PCT data of SCCA in the oropharynx, with a hypothesis that it will have a predictive value for induction chemotherapy response and for midterm locoregional outcome (in progression-free survival). The secondary objective was to compare volumetric and PCT data as independent predictive factors for induction chemotherapy response and midterm locoregional tumor control. Patients with SCCA of the upper aerodigestive tract were enrolled in a prospective trial in which response to neoadjuvant chemotherapy was assessed. Inclusion criteria for the study were as follows: All patients had to be older than 18 years old with T stage III-IV SCCA of the head and neck (TNM staging). Exclusion criteria were a previous head or neck malignant tumor, a history of head or neck irradiation, previous chemotherapy, previous surgical intervention (excluding biopsy), a second malignant tumor or a distant metastasis (distant metastases were excluded with positron-emission tomography/CT, CT, or MR examinations), and known allergy to iodinated contrast agent. The local ethics committee approved the study, we informed all patients of the investigational nature of the study, and the patients signed an informed written consent for participation in the trial. Nineteen patients (17 men, 2 women) with oropharynx SCCA were included in our study. The mean patient age was 55.6 ± 9.2 years. The tumors were staged according to the TNM staging system (Table 1). All patients were examined before chemotherapy and during follow-up with routine contrast-enhanced CT (CECT) scans of the neck. The PCT studies of the neck were performed at the time of the baseline CECT examination. Figure 1 shows an illustrative example of the perfusion parametric maps in a patient with advanced SCCA in oropharynx and oral cavity. The patients underwent endoscopy (if needed, with biopsy) after the baseline CT examination (before induction chemotherapy); at the time of the second examination (after the induction chemotherapy); and during the routine follow-up control, which (according to our protocol) was performed every 3 months for the first year, followed by every 4 months in the second year or on symptom deterioration. Baseline CECT and PCT studies were performed 1.4 ± 0.5 days (95% confidence interval [CI], 1.1–1.6 days) before baseline endoscopy. The mean time between the baseline radiologic examination and the first CECT scan after the completion of the induction chemotherapy was 76.0 ± 4.6 days (95% CI, 68.9–83.1 days). CECT (A) and PCT parametric maps (B-E) of a male patient with SCCA carcinoma in the oropharynx and oral cavity (arrows) as well as enlarged lymph nodes (arrowheads) in Levels I and II on both sides. B, BF map. C, BV map. D, MTT. E, PS map. Induction chemotherapy consisted of docetaxel (75 mg/m2) on day 1, cisplatin (100 mg/m2) on day 1, and 5-fluorouracil (1000 mg/m2) on days 1 through 4 (total dose, 4000 mg/m2) by continuous intravenous infusion with normal saline. The chemotherapy regimen was repeated every 21 days for a maximum of 3 cycles. Subsequent chemoradiation, according to an organ preservation protocol, was planned for all patients with complete response or partial response after 3 cycles of induction chemotherapy and was started 15.1 ± 4.5 days (95% CI, 10.1–21.9 days) after the last cycle of induction chemotherapy. The response status was determined by endoscopic examination. The total radiation dose to the primary tumor and clinically positive lymph nodes was 70 Gy, given in 35 fractions of 2 Gy during a 7-week period. In addition, all patients received cisplatin on days 1, 22, and 43 of radiation therapy. Treatment was discontinued immediately on evidence of tumor progression or major toxicity. Patients with stable disease or progressive disease after induction chemotherapy underwent salvage operation. Surgical resection was also performed in 2 patients with partial response. 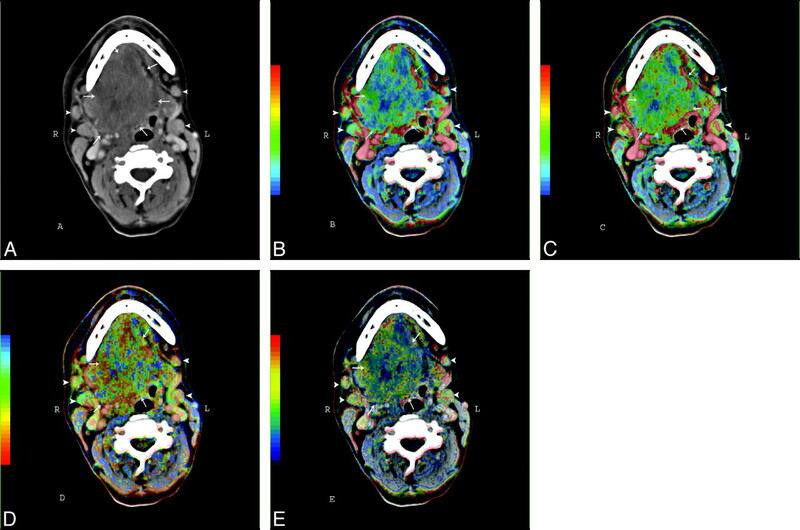 We obtained routine head and neck studies as well as perfusion studies using a 16-row multisection CT scanner (Somatom 16; Siemens, Erlangen, Germany). In all patients, the PCT scan region was based on the clinical information and the area with anatomic distortion on the routine CECT images. The scanned region with PCT consisted of 4 adjacent 6-mm-thick sections. For lesions larger than 24 mm in diameter, the levels with the largest tumor portions were selected. The contrast agent for the perfusion imaging (40 mL of 400-mg/dL nonionic iodinated contrast agent) was injected at a rate of 6 mL/s with a power injector and a 16-G antecubital cannula. PCT scanning (100 mAs, 120 kV) was initiated 6 s after the injection start and lasted 55 s (4 sections acquisition in 1 s). The contrast agent administration was followed by a power-injection of 20-mL saline at the same injection rate. In all patients, after the PCT, a routine CT examination (180 mAs, 120 kV) was performed after injection of 90 mL of 400 mg/dL of the same nonionic iodinated contrast agent (Imeron 400, Altana, Germany) with an injection rate of 2.5 mL/s and a delay of 70 s. The images were primarily reconstructed in 3-mm section thickness for diagnostic purposes and subsequently were reconstructed in 1.25-mm sections for tumor volume measurements. We performed multiplanar reconstructions in the sagittal and coronal planes to aid the diagnosis. The mean effective dose for the combined PCT and routine CT protocol was 9.2 ± 1.8 millisievert (mSv). The perfusion data were transferred for postprocessing to a workstation (Advantage Windows 4.2; GE Medical Systems, Milwaukee, Wis) running commercially available software on the basis of the deconvolution technique (Perfusion 3; GE Medical Systems). Two experienced readers performed the postprocessing in consensus. The acquired perfusion maps represented BF (in mL/100 g tissue/min), BV (in mL/100 g), MTT (in s), and PS (in mL/100 g/min). We defined the extent of the pathologic lesions by using freehand drawn regions of interest in every level. We calculated the mean BF, BV, MTT, and PS values from the tumor sites and the lymph nodes by averaging the mean extracted values for the 4 sections. The endoscopy (with biopsy, when required) served as the reference standard in diagnosis of the primary disease and detection of recurrent disease during follow-up. The clinical endoscopic evaluation was performed by a single head and neck surgeon with 12 years' experience in head and neck surgery, who was blinded to the results of PCT and CT volumetric measurement. Progression-free survival (PFS), defined as the probability that a patient will remain alive and without disease progression, was recorded. Complete response, partial response, stable disease, and progressive disease after induction chemotherapy were defined according to radiologic criteria (RECIST criteria) on the basis of tumor volume. Patients with complete response and partial response were classified as responders. All continuous variables are presented as mean ± SD (95% CIs). To determine a statistically significant difference in PCT parameters between responders and nonresponders, we performed parametric tests after evaluation for data normality (Kolmogorov-Smirnov test). Correlation coefficient analysis (Pearson rho) was also performed. Cox-proportional hazards model analysis was used to identify the potential predicted value of all available baseline parameters. Pretreatment tumor volume, BF, BV, MTT, and PS were the examined predictors of response to induction chemotherapy as well as for PFS. Receiver operating characteristic (ROC) curves were also conducted for the continuous variables (pretreatment tumor volume, BF, BV, MTT, and PS) to identify their predictive value for response to induction chemotherapy. All reported P values are based on 2-sided tests and are compared with a significance level of 5%. SPSS 16.0 for Windows (SPSS, Chicago, Ill) and MedCalc 9.4.2.0 (MedCalc Software, Mariakerke, Belgium) for Windows were used for all calculations. The average tumor volume in the baseline CECTs was 74.9 ± 13.5 mL (95% CI, 68.7–81.1). The postinduction chemotherapy tumor volume was 38.0 ± 17.3 mL (95% CI, 34.4–41.5). Eleven patients were classified as responders (all with partial response [PR]), and 8 patients were nonresponders (all with SD; Table 1). All acquired perfusion studies were free of significant movement artifacts and were suitable for additional postprocessing. The baseline mean BF for the 19 subjects was 72.3 ± 32.0 mL/min/100 g (95% CI, 69.5–75). The baseline BF in the nonresponders group was 69.4 ± 31.6 mL/min/100 g (95% CI, 66–72.3). The baseline BF in the responders group was 77 ± 32.05 mL/min/100 g (95% CI, 72.5–81.4). There was a statistically significant difference between the responder and nonresponder groups (P = .002). The pooled baseline BV was 5.5 ± 2.5 mL/100 g (95% CI, 5.3–5.7). The baseline BV in the responder group was 6.3 ± 2.7 mL/100 g (95% CI, 6–72.6). The baseline BV in the nonresponder group was 4.1 ± 1 mL/100 g (95% CI, 4–72.3). There was a statistically significant difference between the responders and nonresponders groups (P = .00001). The initial pooled MTT was 7.3 ± 2.3 s (95% CI, 7.1–7.5). The baseline MTT in the responders group was 5.5 ± 2 s (95% CI, 5.2–5.7). The baseline MTT in the nonresponders group was 8.4 ± 1.7 s (95% CI, 8.2–8.6). The difference between the responders and nonresponders groups was statistically significant (P = .00001). The initial average PS in all subjects was 10.8 ± 0.3 mL/min/100 g (95% CI, 10.5–11). The baseline PS in the responders group was 12.6 ± 1.7 mL/min/100 g (95% CI, 12.3–12.8). The baseline PS in the nonresponders group was 9.8 ± 3.1 mL/min/100 g (95% CI, 9.5–10.1). There was a statistically significant difference between the 2 groups (P = .0001). Correlations were found between pretreatment tumor volume and baseline BF (r = 0.33; P = .001) as well as between pretreatment tumor volume and baseline MTT (r = −0.41; P = .001). Other PCT parameters had low correlation coefficients: 0.1 for PS (P = .06) and 0.15 for BV (P = .7). A weak significant correlation was also found between postinduction tumor volume and baseline BV (r = 0.2; P = .001). Initial BF, MTT, and PS had a stronger correlation with postinduction tumor volume (r = 0.82; P = .0001; r = −0.48; P = .001; r = 0.46; P = .001). Recurrence developed in 4 patients (2 patients with SD and 2 patients with partial response). One responder and 3 nonresponders died. The PFS (in months) in the pooled patient group was 10.9 ± 5.8 (95% CI, 8.1–13.7). In the group of responders, the PFS was 11.2 ± 5.5 (95% CI, 7.5–14.9), whereas in the group of nonresponders the PFS was 10.5 ± 6.5 (95% CI, 5.1–15.9). There was not a statistical significance between the 2 subgroups (P = .8). A correlation was revealed between PFS and radiologic response (complete response, partial response, stable disease, and progressive disease) (r = 0.47; P = .001) for all patients. In the responder subgroup, the correlation was stronger (r = 0.48; P < .001) than in the nonresponder group (r = 0.34; P = .001). The PCT parameters had significant correlations with the PFS for all patients as follows: BF (r = 0.68; P = .0001), BV (r = 0.59; P = .001), MTT (r = −0.35; P = .001), and PS (r = 0.61; P = .001). A significant correlation was revealed between pretreatment tumor volume and radiologic response (r = 0.27; P < .0001). The pretreatment tumor volume also correlated with the PFS for all patients (r = 0.4; P < .0001), whereas postinduction tumor volume correlated significantly with the PFS in the responder group (r = 0.64; P < .0001) and in the nonresponder group (r = 0.22; P = .006). The Cox proportional hazards model for the pooled patients showed that predictors of the PFS on the baseline examination were only pretreatment tumor volume (P = .0001) and BF (P = .001). The Kaplan-Meier analysis for these variables is shown in Fig 2. In Fig 3, the increase in sensitivity (coupled with a decrease in specificity) for the prediction of recurrence and treatment response is plotted for the increasing BF values in the general population. The slope of the sensitivity curve is steep in the midportion of the graph, meaning that with the difference between 30% sensitivity and that of 100% sensitivity on the basis of pretreatment BF is approximately 10 mL/min/100 g, which implies that its usefulness is at the extremes of the graph. Kaplan-Meier survival analysis showing the predictive value of tumor volume (A) and BF (B) values for progression-free survival. ROC analysis of BF measurements vs recurrence (A) and induction chemotherapy response (B). The results of the ROC analysis to predict response after induction chemotherapy are summarized in Table 2. Pretreatment tumor volume and BV showed a 100% sensitivity, which, however, was statistically significant only for the BV. MTT and PS parameters had the highest specificity (100%; P = .0001). BF showed satisfactory sensitivity and specificity (84.2% and 66.7%, respectively; P = .0001). The slope of the sensitivity curve for the prediction of response in the midportion of the graph shows that the difference between 20% sensitivity and that of 90% sensitivity on the basis of pretreatment BF is approximately 40 mL/min/100 g, which implies that its clinical usefulness may be at this region (Fig 3B). Further Cox proportional hazards model analysis for the predictive value of the baseline PCT parameters in the responder group after the induction chemotherapy and the postinduction tumor volume did not reveal any statistically significant results. Previous studies have shown that the pretreatment CT-based tumor volume has a predictive role for the local control of SCCA at different head and neck sites after treatment with nonsurgical organ preservation.25-28 The likelihood of local recurrence is higher in large-volume tumors than in small-volume lesions arising in the larynx, hypopharynx, and nasopharynx. On the other hand, in the oropharynx, the tumor volume does not seem to be predictive of local control in T2–4 stages in both surgical and nonsurgical series.27,29,30 PCT studies in large patient cohorts showed significantly elevated BF, BV, and PS values as well as shorter MTT values in the SCCAs compared with the healthy tissue.19,22 On this base, it was postulated that PCT measurements would be valuable as outcome predictors. It is interesting to note some studies showed that PCT measurements may have prognostic value for response to radiation therapy16,18 as well as to induction chemotherapy.15,17 The theory behind these findings is that oxygenation, which is an important predictor of tumor response to radiation in vitro (and maybe in vivo)31 and may also influence the efficacy of chemotherapy agents, particularly those affecting cell cycling and free-radical formation,32 is closely associated with perfusion parameters. We sought to compare the role of PCT with that of the pretreatment CT tumor volume and to assess the role of PCT measurements to predict the PFS and local tumor control. Our study of advanced oropharyngeal SCCA showed significant (though weak) pretreatment tumor volume correlation with the radiologic response grade, suggesting a role for tumor volume to predict PFS in these patients. The predictive value of tumor volume is maintained after the neoadjuvant chemotherapy and is more pronounced in patients undergoing organ preservation protocols than in those undergoing surgical excision. However, perilesional edema and inflammatory treatment response surrounding the lesion as well as fibrotic changes in the posttreatment regimen may affect accurate tumor delineation and volumetric on follow-up scans; thus, the precise predictive value of baseline tumor volume may be limited. The tumor volume (and, indirectly, the T stage of the tumor) correlated weakly with the BF. This finding is in contrast with a study in which no correlation was found between PCT parameters and T stage.19 The major difference between this study and our study is that our patient population consisted exclusively of those with T3 and T4 tumors. Moreover, the correlation coefficient between BF and tumor volume was not high, which may reflect the fact that T3/T4 tumors may have a mixed pattern of microscopic necrotic parts and highly angiogenic foci that may result in variable (predominantly low) mean PCT measurements. Although an exclusion of the gross necrotic parts may seem feasible during the region-of-interest analysis, the detection of the microscopic necrotic sites in the perfusion and cross-sectional images is not possible; thus, they represent a cofounding factor in the correlation between practically any perfusion-associated parameter and the tumor volumetric. This also may be the reason for the lack of any significant correlation between tumor volume and BV or PS. MTT correlated negatively with the tumor volume, indicating that large tumors may have more extensive arteriovenous shunts and/or leaky vessels, which result in faster BF. One important finding in our study was that there was no statistically significant difference in the PFS between the responders and nonresponders after induction chemotherapy. One possible explanation may be the small number of patients. Nevertheless, this finding implies that tumor volume and T stage may not be the only criterion for including patients in neoadjuvant therapy and highlights the importance of a careful patient selection on the basis of functional tumor parameters. Such an approach may maximize the therapeutic response and save time for the nonresponders. PCT perfusion parameters seemed to outperform the morphologic characteristics, being significantly different between responders and nonresponders with high BF, BV, PS, and low MTT favoring a tumor response, presumably reflecting better tumor oxygenation. BF was also a significant predictive factor in the Cox proportional hazards model, which is in concordance with the work of Hermans et al,16 and all PCT parameters showed significant sensitivity and specificity rates to predict the tumor response to neoadjuvant radiochemotherapy. Reinforcing the initial evidence that patients receiving adjuvant chemotherapy may benefit from elevated tumor BV values, our study showed that higher BV may predict tumor response, but the sensitivity and specificity rates and the area under the curve (AUC) were not as high as those in the work of Zima et al.15 We believe that the reasons for this discrepancy are slightly different patient populations and different baseline BF, BV, MTT, and PS values, especially in the responders group. However, BV in both studies showed higher sensitivity than specificity, highlighting its potential as a stratification variable before the start of neoadjuvant chemotherapy. Compared with BV, BF showed more acceptable sensitivity and specificity rates as well as AUC, and its predictive value for PFS in the pooled patients group makes it a more appropriate variable for clinical application. With extension of the reported evidence about pretreatment PS values,17 higher PS values were a positive response predictor in our study. We assume that the higher PS values are coupled with the increased BF and BV and indicate an increased angiogenesis and/or vessel leakiness, which in turn allow better tumor oxygenation. Considering the impact of PS in the measurement of the BF, it needs to be mentioned that use of our software requires certain simplifications in the applied tracer kinetic analysis (eg, assuming uniform and instantaneous mixing of contrast in the vascular or extravascular compartment), which may mask significant predicting factors or more pronounced P values in the significantly related parameters.33 It is possible that the application of more realistic tracer kinetic models34 with new perfusion-associated parameters (eg, extravascular extracellular BV) may provide additional information. The failure of PCT measurements to predict the patients' survival in the responders group after postinduction chemotherapy may be because of the altered tumor perfusion after the neoadjuvant chemotherapy. Thus, the baseline perfusion values did not reflect the true tumor hemodynamics after the completion of the radiochemotherapy. This may be addressed by a second PCT examination in which the new perfusion values would be used as input data for the prediction of recurrence and the estimation of cutoff values. Assuming that the BF (like BV and PS) will become lower after successful induction chemotherapy, as described by Gandhi et al17 in a small population, the new BF threshold may be lower than 66.2 mL/100 g/min (as indicated in our ROC curve analysis), and this may improve the sensitivity and specificity of the method. It is also possible that serial PCT measurements after each induction chemotherapy cycle might reveal alterations of the functional parameters that could revise the initial treatment plan and, thus, predict the response in our patients. However, our study design did not allow for such measurements, which would demand a very high patient compliance. Our analysis was based on the baseline and postinduction morphologic CT as well as on the baseline PCT parameters, with a goal of assessing their contribution in treatment response prediction models. The results of may serve to build 2 robust models: 1) a model that will estimate the PFS according to the initial tumor volume and the BF value, and 2) a model that will identify patients who have a high probability of responding to induction chemotherapy. The first model will give a rough estimation of survival according to the demonstrated Kaplan-Meier graphs (Fig 2). For instance, a patient with pretreatment tumor volume greater than 37 mL and a BF less than 64.8 mL/min/100 g would have an expected PFS less than 15 months after an induction chemotherapy protocol (regardless of salvage surgery or radiochemotherapy in the postinduction phase). The second model may predict the response to induction chemotherapy and thus allow for better selection and reduction in number of patients with advanced oropharyngeal SCCA who would undergo such treatment. For instance, a patient with BV higher than 7.4 mL/100 g and PS higher than 8.6 mL/min/100 g would be expected to show a good treatment response to induction chemotherapy with concurrent radiation. Our study inevitably had some limitations. Our patient population was too small to evaluate the predictive role of baseline PCT-derived parameters for the early and short-term outcome in patients with SCCA in the upper aerodigestive tract. However, the compact study design including patients with advanced SCCAs and the strong, statistically significant results are very promising, and additional prospective studies are required to confirm our results. Furthermore, our reference standard for classification of treatment response was the CT-based volume measurement, which may be consistently performed across different institutions; however, CT assessment of the extent of remission after completion of neoadjuvant radiochemotherapy may lead to false predictions in a significant percentage of patients.35 The classification of the patients as responders on the basis of the RECIST criteria introduced a bias in favor of the CT volume measurements. The ideal study design, as mentioned above, should include perfusion estimation after the induction chemotherapy to evaluate whether routine CT or PCT more reliably predicts PFS. Finally, the mean follow-up in our study was short term (approximately 11 months), and the 2-year as well as 5-year survival rates were not assessed. A prospective long-term follow-up of our patients is the aim of our next study. We demonstrated the predictive value of tumor volume and PCT values for the PFS in patients with advanced oropharyngeal SCCA. Pretreatment PCT parameters could predict response to induction radiochemotherapy, whereas they did not have any predictive value for the postinduction local tumor control in the responders. Our findings highlight the role of the PCT tumor measurements as a noninvasive, inexpensive, readily accessible tool that may allow prediction of midterm PFS and lead to improved patient stratification in the organ preservation protocols to maximize the therapeutic benefit. Accepted after revision November 10, 2008.